Or actually, that would be CMC Records, a "division" of EMI and suddenly it all makes sense! Was wondering where they'd been all this time-- not the band, the label. Actually CMC's done quite well at extending the careers of many a Rock n' Roll has-been, and that's not to say, call it a day, nothing left to give, touch gloves with twilight; but basically, it's a breeding ground for Classic Rock revivalists where some have fared well, and some have remained invisible. 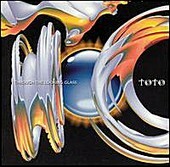 Toto's one of those bands you look back on and think, nah, couldn't have been them-- could it? Yep, the same band that was big in the '70s and '80s, forgotten in the '90s, and more than likely shared stages with Air Supply and Eddie Rabbit at one time or another in their prime. Far from the one off surprise comeback, Toto's celebrating their 25th anniversary in grand style, with their new covers album and tour that'll carry them through early 2003. I was a fan back when the Solid Gold Dancers reigned supreme, yes I'll admit it, and even after "Hold The Line," "Rosanna," and "Africa," you know, their big ones, I still have to look back in awe over 25 million records? And six Grammies? So there's something in the make up of this band that stretches a bit further down than their two or four year top 40 runs might otherwise suggest -- maybe not quite "supergroup" but then nothing to sneeze over either. With the Lukather/Kimball team of guitarist/singer firmly in place, the signature sound returns for a run in with their past, transcending further back then when even they started, and so ironically, we might think this a rebirth of sorts for a band rediscovering their own roots to move forward-- or they may simply be doing it for the hell of it. Either way, Lukather's guitar playing skills remain superbly triumphant as one of those few players that shone through feel rather than flash, yet the spark's always there when needed. The tracks, eleven in all, range from Rock ("Bodhisattva," "I Can't Get Next To You," "Sunshine Of Your Love"), Pop ("While My Guitar Gently Weeps," "House Of The Rising Sun,"), Reggae, ("Could You Be Loved"), R&B ("Living For The City," "Burn Down The Mission,") and Folk styles-- just your average everyday crowded house blend that have influenced the band and their wide ranging reach of original music. Certainly a few are interchangeable where names like John, Taupin, Fagan, and Dylan are concerned and Kimball's vocals handle each twist and turn capably and almost effortlessly; forgetting for a moment that he was in fact a solid singer, and soulfully, goes a step forward here. The band plays tightly and true to form versions led by the rhythm and blues section that's occasionally hunched by a heady Lukather run or percussion, all of which come together magnificently for the album highlight "Burn Down The Mission." A clever version of Costello's "Watching The Detectives" precludes the Dylan closer, where the band again turn up the blue water stir. They could've gone maybe a few feet further, let alone the extra mile, on the drab album cover, but besides that, it's an exemplary album of well-chosen name brands that the resurgent rockers faithfully restore.